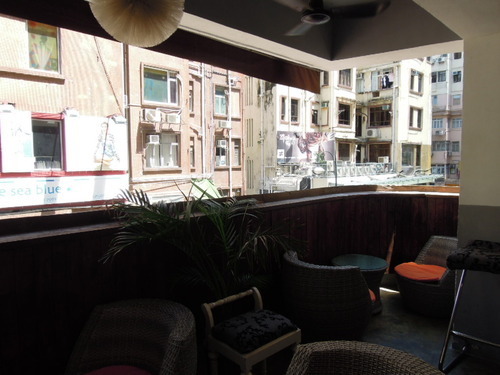 Hong Kong boasts two establishments when it comes to authentic French crêpes, and they are La Creperie and Fleur de Sel. It seems like Hong Konger’s love for crêpes has not subsided, with La Crepere opening its second branch in Sheung Wan in August this year, and Fleur de Sel following its footsteps and presenting its second venture on 51 Graham Street, Soho. 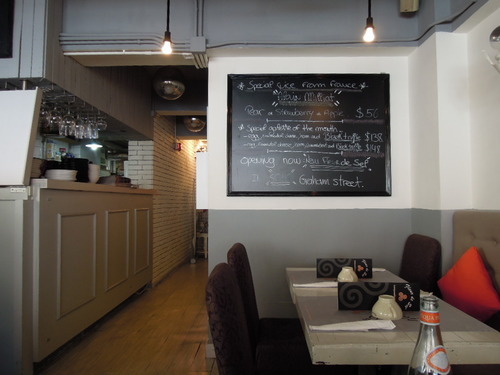 Located on the second floor of a nondescript building in Causeway Bay (opposite the Lee Theatre), Fleur de Sel is an intimate and cosy space. 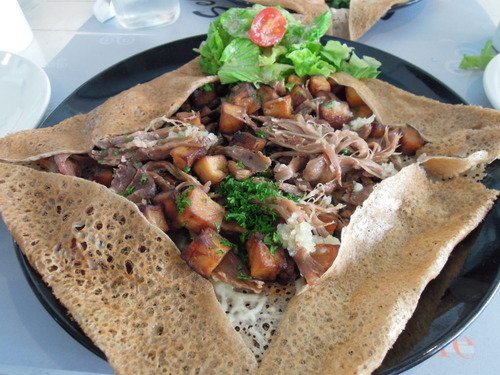 The menu is simple but not limited, with a selection of galettes (savoury crêpes) and dessert crêpes to choose from. The staff are predominantly French; the service could have been warmer, but it didn’t really bother me as I was there for nothing else but the crêpes! The difference, to me, between La Creperie and Fleur de Sel is that the galettes at La Creperie are crispier, hence have more of a bite and are more delicious, whereas the ones at Fleur de Sel are a touch too soft and pliable; however, the fillings at Fleur de Sel are better, with the ingredients being flavourful and the tastes spot-on. 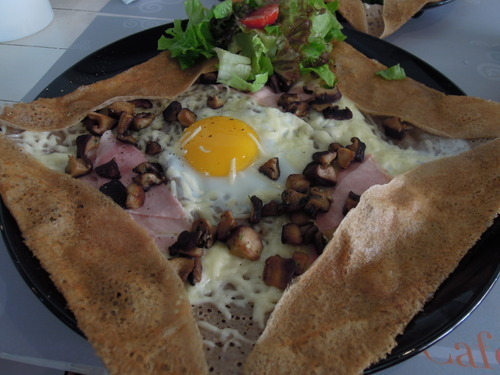 (1) We started off with La Super Complete ($78), which was filled with ham, cheese, egg, and mushrooms that came together nicely. The finely chopped mushrooms were full of flavours, and the runny-yolked sunny side up was beautiful. 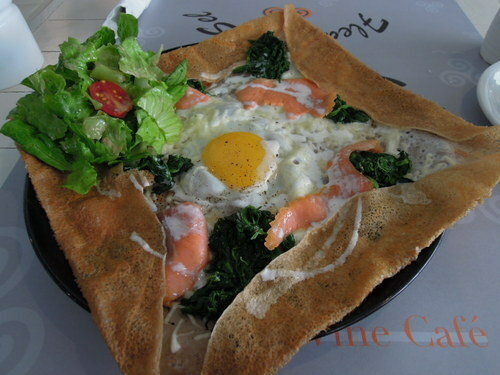 (2) La Terre-neuve ($112), filled with smoked salmon, egg and spinach was equally accomplished. The smoked salmon had a remarkable taste, and the double cream added richness but was not overpowering. (3) Ordering La Sarladaise ($128) made my meal complete, as it was filled with confit of duck that had deep and distinctive flavours, mushrooms, and potatoes that added extra textures to the galette. The duck was thinly shredded so it was easy to eat. (4) La Bourguinone ($128) was by far the best dish at Fleur de Sel! 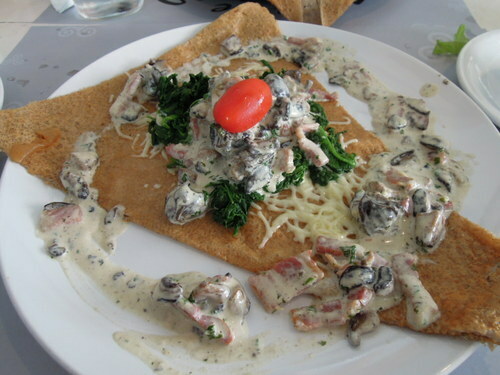 Filled with mushrooms, bacon, spinach and snails fricassee that were tender and soothing, the galette was then smothered in a creamy and delectable white wine sauce. (5) The smoked sausages in La Toulouse ($94) were chunky and delicious with meaty flavours. 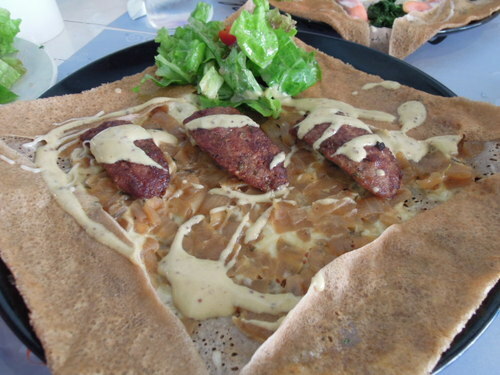 The caramelised onions were sweet and mellow, and the French mustard gave a good kick; however, I wish there were more sausages in this galette. 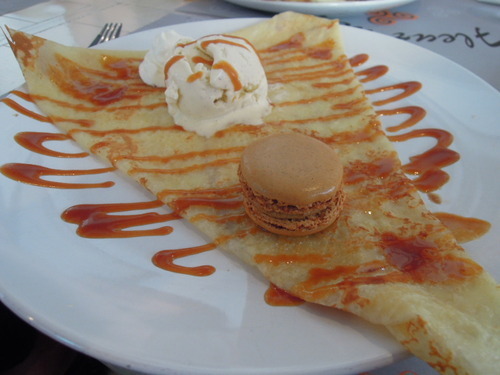 (6) No one needs to be convinced as to how absolutely amazing dessert crêpes are! 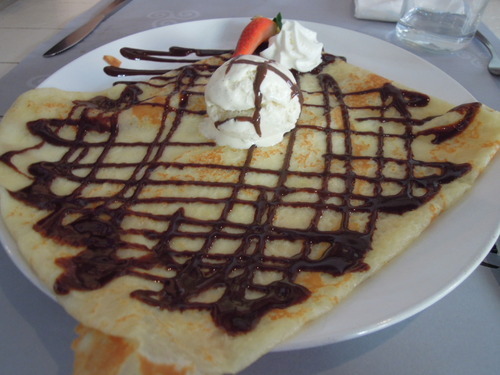 We started off with the Crêpe au chocolat maison ($46), which was drizzled in home made chocolate sauce. 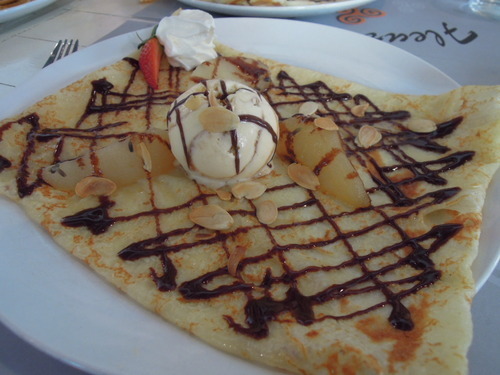 Served with a large scoop of vanilla ice cream, this crêpe was simple and heavenly. (7) La Poire ($68) was topped with caramelized pear with lavender and crème brûlée ice cream, and was a fruity and refreshing option. The crème brûlée ice cream was decadently sweet, and the caramelized pear had a hint of pleasant alcoholic taste but could have been boiled a tad softer. (8) Last but not least, La Macaron ($88) was many girls’ dream come true, as it combined two of our favourites, crêpes and macarons, into one! The macaron was caramel-flavoured, and toffee sauce was lovely and thick; it was sweet and divine!